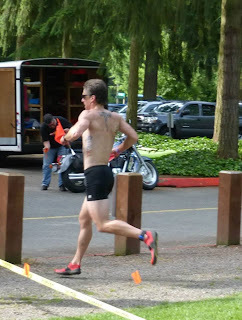 On June 29th, I raced in the BuDu Racing Five Mile Lake Sprint Triathlon, in the "Retro" division. This is a group outside the normal racing population which supports the Juvenile Diabetes Research Foundation(a portion of all the entries went to the JDRF, but this division makes an additional donation), and disallows the use of wetsuits and any aero bike equipment, getting back to the roots of triathlon as it was raced "back in the day". Speedo's are encouraged, as well as costumes of any iconic image from the 60's, 70's, or 80's. Having raced triathlons back in "those days", it's a bit of a coming-home for me, less of a money race and more of a race of truth -- strength and mental toughness will get you across the finish line ahead of your competition. Last year I did this race in the retro division with my wife, one of only four that signed up to race in that wave. This year, with my wife having only 6 weeks left before our daughter is due to deliver, I was racing on my own, and decided to "go for it" speed wise. Also, there were five of the Rock Steady kids racing in their respective age groups. I had laid down a challenge at the first workout with them, that any of the kids who beat me at the Labor of Love Bonney Lake Triathlon on Labor Day weekend would receive a "pretty cool" prize. The Five Mile Lake race gave me a bit of a yardstick against which to measure some of these athletes, some of whom have qualified for the USAT Junior Triathlon National Championships (draft legal format). The JDRF folks truly cater to the racers in the retro division, carrying any gear from the start at the lake shore, offering dry towels at T1, and generally pampering the athletes like well-paid butlers. The last start wave is reserved for the retro racers, which is a bit of a showcase, but also affords the most numbers of people to pass for those that are motivated by such things (count me among those). We forged into the waters 10-strong for the quarter-mile three-sided swim. 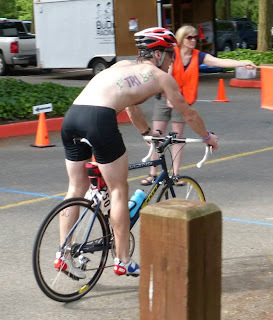 Coming out of the water, I was third, but made a fast transition and got to the bike leg first. Within a mile, though, I was passed by the latest addition to the retro wave, the decision made because he had forgotten his cycling shoes. He was riding fully aero, however, and would be disqualified for it. I forged ahead, continuously picking off riders from the previous waves. Riding a Scott Waimea configured as a road bike (set back seatpost, drop bars, this bike is my dedicated trainer bike), I managed to average 22 mph over the slightly rolling course, only a minute off my previous best time from 2007 which was done fully aero. Another quick transition and I was on the run, passing the lone retro participant that was in front of me. and arrived at the finish fully spent. 1st in the 50-54 AG (my AG). The post-race feast was the usual BuDu Racing feast of bagels, sandwiches, fruit, bars, and spreads. I refueled, waited for the awards to be given out, then got ready to make my ride to my moonlighting job as hired wrench at Inspired Ride Bicycles. Those kids? Well, one of them beat me soundly by a good three minutes, though most of that was on the run. I was only six seconds slower on the bike. Another one, the elder daughter of the head coach, was less than one second behind me in overall time, and I made all that time on the bike -- she was eight seconds faster on the run, and close to two minutes faster in the swim. Looks like I have my work cut out for me, eh? Trofeo Strada Bianca -- Hampsten's awesome ride!